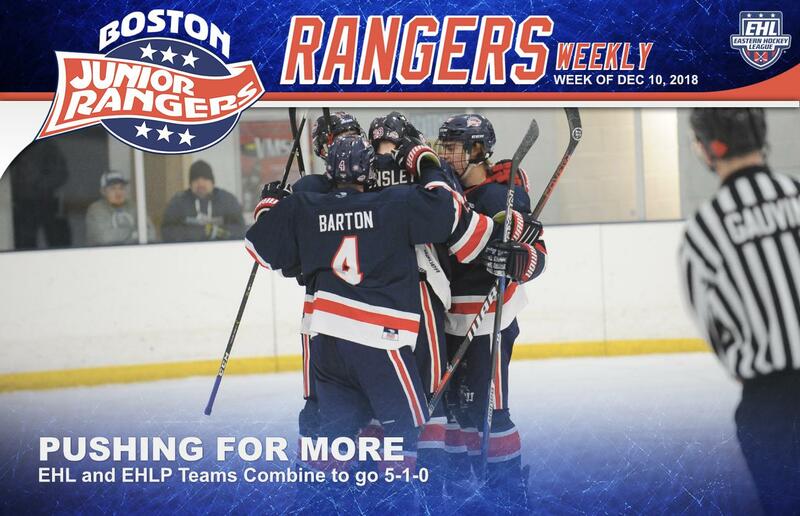 TEWKSBURY, MA -- Both Rangers' squads were back in action this past week, as each team hit the ice for a trio of games. The EHL team took care of business last Wednesday at home against the Walpole Express, then went 1-1-0 in a pair of games against the Philadelphia Jr. Flyers and the Philadelphia Little Flyers. After the weekend, the Rangers remain in 2nd place in their division with a record of 16-8-2. On the other hand, the EHLP squad took care of business by winning all 3 of their games last week and continue to own the league's best record at 23-3-2. On Wednesday, the EHL team got back to work squaring off against the Walpole Express for the first time this season. The Express held an 8-11-4 record and were on a 6-game losing skid heading into Wednesday’s matchup. After a scoreless opening frame, Johan Nash found the back of the net on the power-play around the 11-minute mark of the 2nd period, to give the Rangers the lead. The power-play units continued to click as Erik Nilsson found the back of the net on the man advantage near the end of the period, to put the Rangers up 2-0. However, the Express, responded with a pair of goals of their own in the 3rd to knot the game up at 2 goals apiece, and sent the contest into overtime. Despite a big the 3rd period comeback from Walpole, Go Uemura found the back of the net just 44 seconds into overtime and the Rangers took the home the 3-2 victory. Billy Girard made some big saves in the win, stopping 32 of 34 total shots he faced. On Saturday, the boys headed down to Pennsylvania to face-off against the Philadelphia Jr. Flyers. After a scoreless 1sr period, the Jr. Flyers got on the board first with a goal around the 5-minute mark of the 2nd frame. However, the Rangers quickly answered back as Nash found the back of the net on the power-play in the final minute of the frame. The Rangers didn't let up in the 3rd, as Mitch Haight gave the Rangers the lead just 1:30 into the final period. Zach Norby gave the Rangers some insurance with a goal a few minutes later, and despite a late Jr. Flyers' goal, the Rangers held on and won the game by a 3-2 final. Aiden Curry stopped 28 shots in the win, and now owns a 8-2-0 record for the season. The squad wrapped-up the weekend on Sunday with a matchup against the 1st place, Philadelphia Little Flyers, who came into Sunday’s game with a 20-2-1 record. The Rangers drew first blood as Andrew Keith gave his team the early advantage around the 7-minute mark of the 1st period. However, the Little Flyers responded with 6 goals in the 2nd period, to take a commanding 6-1 lead. Will Roberts was able to get a goal back for the Rangers, but it wasn't enough as the boys fell by a final score of 7-2. The EHLP squad started off their week last Thursday, with a matchup against the Valley Jr. Warriors. Thursday's game marked the 4th matchup between the 2 division foes this season. The Rangers had dominated their opponent over the previous 3 games, beating them by a combined score of 27-2. Dennis Engelson got things started for the Rangers near the end of the 1st frame and the flood gates opened after that, as the Rangers scored 5 times in the 2nd period to take a 6-1 lead. Tanner Caldarola (2), Matt McPherson, Joe Moffit, and Mitch Gillespie had the 2nd period goals. Caldarola completed the hat-trick just 50 seconds into the 3rd to give the Rangers a commanding 7-1 advantage. Both Luke Marsh and TJ Aiello added insurance goals as the Rangers won by a final of 9-2. Bobby McCloskey was solid between the pipes, stopping 21 shots in the win. On Saturday, the EHLP team headed down to Pennsylvania with the EHL squad for the weekend. The boys faced-off against the Philadelphia Jr. Flyers on Saturday as the Rangers were looking for a repeat of last year’s EHLP Championship Game. The squad came out flying, outshooting the Jr. Flyers 17-6 in the 1st frame, as both Jake Mecrones and Xander Wardlaw found the back of the net to give the Rangers the early 2-0 advantage. The Jr. Flyers responded with a goal of their own in the first few minutes of the 2nd period, but it was quickly answered by Matt Orlando to give the Rangers a 3-1 lead. Both TJ Aiello and Nick Weaver each added a goal later in the frame to give the Rangers a commanding 5-1 lead going into the break. Orlando added an insurance goal just 1:13 into the 3rd period and the boys cruised to a 6-1 victory. Cam Libby stopped 18 shots in the winning effort. The Rangers got back to work the following day with a matchup against the Philadelphia Little Flyers who held a 17-4-2 record before Sunday’s contest. The Little Flyers got on the board first with a power-play goal near the halfway mark of the 1st period. However, McPherson was able to even things up a one goal apiece in the final minute of the frame. The Rangers kept the momentum rolling as Marsh gave the boys the lead with a goal just under 2 minutes into the 2nd period. Caldarola added an insurance goal in the final seconds of the frame and the Rangers held off the Little Flyers attack for the rest of the game, winning by the final score of 3-1. Libby stopped 25 more shots in the win, and remains unbeaten so far this season with a record of 9-0-0. The EHL squad will head to Connecticut this upcoming week to participate in a league-wide showcase, as they will have a rematch against the Jr. Flyers on Thursday followed by a matchup with the Philadelphia Revolution on Friday. The EHLP squad on the other hand, will enjoy some nice time off and won’t play again until January 12th.